Brazil’s National Collective of Electricity Workers is staging a nationwide strike with Eletrobras workers between June 11th and 13th to protest against the Michel Temer administration's plans to sell the company. The Eletrobras system includes electricity distribution, generation, and transmission companies in all regions of Brazil, and selling the state-owned enterprise is one of the top priorities of Temer’s economic plan. The work stoppage is being supported by several people’s movements, including the Landless Workers’ Movement (Movimento dos Trabalhadores Rurais Sem Terra – MST), the Small Farmers’ Movement (Movimento dos Pequenos Agricultores – MPA), the Homeless Workers’ Movement (Movimento dos Trabalhadores Sem Teto – MTST), and the Unified Workers Central (Central Única dos Trabalhadores – CUT). The president of the National Confederation of Urban Services Workers (Confederação Nacional dos Urbanitários – CNU), Paulo de Tarso, believes in a joint action with unions and movements to stop the coup government's privatization plans for Brazil’s energy industry. “Unity is our strength. Our unity will challenge this government that is usurping society’s rights and victories, tearing the national patrimony to shreds and handing it over to foreign capital,” Tarso argues. 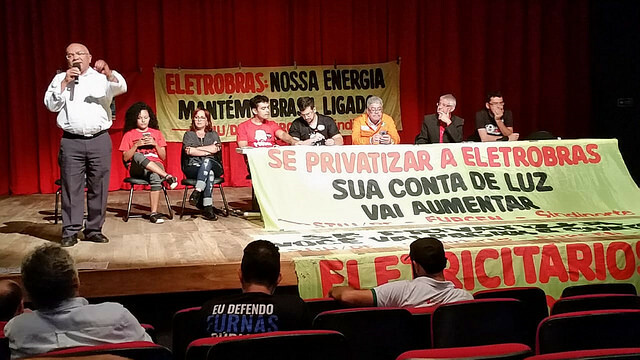 Marco Baratto, a director of the Landless Workers’ Movement, points out that standing up for Eletrobras is a matter of energy sovereignty, national security, and access to quality public service in Brazil. “[Selling Eletrobras] will not only increase energy bills in remote areas that are [considered] invisible in Brazil, but will also impact the access and quality [of the service], because it will be in the hands of corporate groups,” he argues. *With reports by Cristiane Sampaio.